LIBBIs: How do I change to a different session? If you signed up for a LIBBI session and need to change to a different the session, simply sign up for another session. There is no consequence for changing to a different date and time. Log in to Vision and select the Student Services & Financial Aid tab. 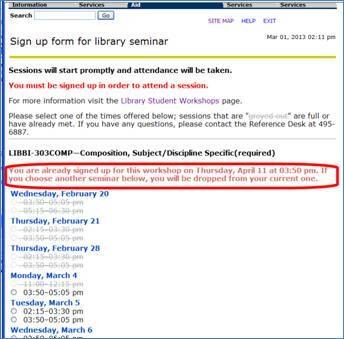 Select a Library Seminar from the drop menu. On the sign up page with the session selections (shown below), you will be able to view your current session date and time. To change sessions, just select another session from those that are still available. Sessions that are full will be greyed out. Click Submit. When you choose another session your name will automatically be dropped from the previous session and added to the new one. Change sessions as needed, there are no restrictions. Remember, however, sessions are limited to 30 students and may get filled up so it is best to sign up early. If you forgot what session you signed up for, see How can I find out what session I signed up for? << Previous: How do I sign up?